The Lululemon Upload is live! Nothing for me yet but I’m still considering the Round Trip Jacket in a size up. I was hoping we would see the Pink Cool Racerback (Candy Pink) that I shared in The Sweat Edit Group (thanks to Ms. B! ), or the pink (Candy Pink?) swiftly Tech SS that we’ve seen previewed. The Down & Around Bomber is very interesting and I’d love to try it on in that cedar color. I would have probably ordered the Press Pause Jacket if it had uploaded in Pelt, but unfortunately the stores have only gotten olive and black. Did you order anything or try anything on in store today? Last weeks upload post, and fit review post, and here. "Guest Fit Review: Athleta Threadlight Relaxed Tee, Mesh Shine Salutation Tight, Paradise Floral Chaturanga Tight"
"Guest Fit Review: Athleta Blossom Intuition 7/8 Tight, Shadow Camo Relay 2.0 Capri, Tropical Precision 7/8 Ankle Tight"
I just ordered the heathered black/gray festival bag. What is the colour of the festival bag in your post? I kind of like the down and around bomber. The cedar color is nice. So bizarre to be getting swim tops and down bombers in the same upload. Went ahead and ordered this bomber. Curious to see it in person. My mindset has pretty much shifted toward autumn purchases at this point so I’m actually happy to see some cool weather items popping up now. Let us know what you think of it. I suspect this will be one of those items only in select stores. Mine too. I’m only looking at fall stuff now. Yep, I’ll definitely let you know! Hopefully it won’t take forever for me to get it. I have experienced a significant increase in shipping times over the last 6 months or so. More stuff shipping from stores or Sumner WA which takes a full 7 days to reach me. Lucky you! Not so great if you live on the east coast. It’s not only that that has caused delays, it’s slower order processing. I still haven’t received shipment notification and it’s after midnight (now Thursday). This is typical these days. In the past, orders I placed on Tuesday uploads would be delivered at my house on Thursday. I really like the rose quartz run times. May give them an order to try. My biggest lulu order in years…festival bag, round trip jacket, and fast as light muscle tank…loving the free to be bag also, but did not order. OMG, too many goodies. The US did not get the patterned festival bag but dark chrome is a gorgeous color to have. I also ordered run time and hottie hot shorts in rose quartz, speed up short long in CC, and long distance SS in viola. Does anyone else hate the new product photos? I feel like they’re lazy and cheap looking. They hardly show what the product is and now a days the description box is so blank. I agree about everything you said. It would also be nice to have a non modeled photo of the item and length measurements for the tops. However, they are finally providing inseam lengths for the pants. Yes! a lots of the tops have fabric description really bare. The photos look fun i.e. the models look playful but finding that the angles of the photos are weird to judge what the product actually looks like…. not to mention a close up of a top when you’re viewing the bottoms its actually paired with. How did you order the heathered black festival bag Mrs. O? I keep getting told it’s unavailable. Did it already sell out? That does not seem possible. Maybe it has sold out. I was worried that it would so the minute I saw Cristina’s upload post, I went on the site and ordered it. I no longer see the heathered black/gray option anymore. I’m sure stome stores will receive it. I’d call your local LLL and place a phone order. Thanks. I did get an order to place, but now the bag is gone again. Fingers crossed it doesn’t get cancelled! Fingers crossed! I hope you get it Sarah. I’ve learned my lesson from the past to immediately order. I can think about it after I order if I really want to keep it. The hard part is determining what items will sell out. But lately cute bags in interesting colors seem to sell out right away. It shipped. I’m so excited, and shocked how quickly that sold out. Mine shipped too! I was a bit worried because the tracking number said it was delivered in January 2017. I called GEC and they told me it has been processed. Unfortunately, sometimes FedEx recycles tracking numbers. I was so worried my order wouldn’t process. I’m so glad yours shipped. We’ll be festival bag buddies! I wish I was a better judge of what things will sell out. Sometimes I hit it on the mark. Often times, I’m wrong. I’ve learned now to just order now and decide later. The Fast and Free in the Dusky Lavender print are tempting but I’m afraid they’ll have the white lining which I just don’t like. I’m pretty sure everything else I’m considering was released last week; Aligns in Pelt and Melanite, Speed Up Crop (before Lulu realizes they might be affordable at $88)….. other than that, my newest favorites haven’t been released in new colors; Pushing Limits Tights and Crops, Final Lap Crops. Does anyone else thing the Chase Me Crops look a little dated? And seem expensive compared to other comparable crops? I better try the Speed Up Crop soon!! FYI, the Speed Up Crops (and Tights) are difficult to pull up the first time. I had a heck of a time doing it. But once I got them up it’s fine. Since they are run crops, I was told that the back is not double paneled (to create a lighter tight). The are opaque when standing but are not meant for bending, squatting etc. They are a tad sheer when doing the bend test. Sizing up doesn’t help. Thanks for the heads up! I didn’t realize the non Run pants were double paneled, that’s good to know. I usually don’t worry about sheerness (is that horrible?! ), I figure people shouldn’t be staring at my bum if I bend over, haha. I like my running pants tight so I’m definitely going to try these on. Hopefully my store has them by the end of the week, if not now! Lol. I don’t intentionally look at other’s bums. But sometimes, it’s just right in front of you. Haha! Lol! I didn’t mean to imply that you did! ? In yoga especially it’s inevitable. I just don’t get this preoccupation with sheerness and sweat showing. I have yet to experience any Lulu pants being sheer like some brands that look like they’re just dark tights/nylons so I guess I’m not worried. And I definitely have pants designated for yoga classes that are proven opaque so I don’t moon someone who is just an innocent bystander. As for sweat, well I’m working out so I decided it’s perfectly acceptable to have swamp bum! I should probably quit reading the product reviews on the site! But I give you a hearty thank you for the Athleta Fit Review ?? Those pants have definitely caught my eye, I should probably just try them. FYI, the dusky lavender f&f were opaque and printed on a lavender background. I hardly have any issue with sheerness with LLL except on occasional tights, which no matter how many times you size up it’s sheer. I’ve only run into 2-3 over the years. The others, like run tights are barely sheer. I once tried on a black tight from Adidas that was so cool looking until I got home and tried to do a fit review. Just standing, you could see the sheerness in sunlight. Those definitely went back. The dressing room was so dark, I couldn’t tell. LOL. My husband was laughing so hard because he knows I’m sensitive to sheerness. The dusky lavender isn’t white backed – I picked them up today! Fabulous!! I’m going to have to order those. Thank you for letting me know! Other than the Round Trip Jacket nothing for me. Infact I might return the jacket because the hem at the back doesn’t always lay flat, it flips up like a ducks bill which I believe is due to the luon lining. Even when I get it laying flat I am worried it won’t stay that way. I love the rose quartz colour in the Run Times ll but the new version fit is awful and that is just another product I won’t be buying due to changes in fit. It looks as though my purchases are going to continue being few and far between. The hem laid flat for me. You might be pleasantly surprised. The double back tank, fast as light singlet and break free tank are of interest to me. I also like the all set mini bucket but need to see it in person before purchasing. The mini bucket looks really cute!! I’m hoping it comes in a fun print or color. I wonder how close to hero blue the new blue in define jacket is. I find the tanks to be super busy on the back. 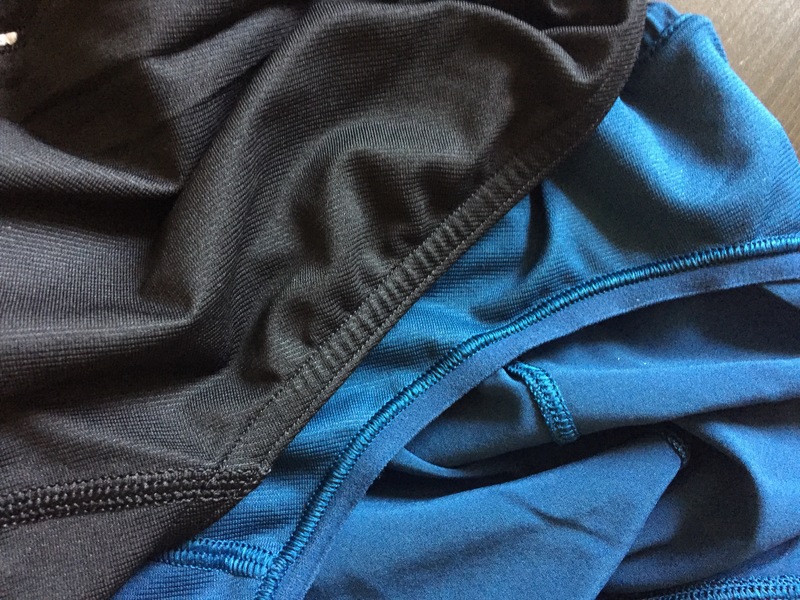 I used to have a variety of styles but am finding that I reach for crbs as I wear speed shorts and tights….and the crb seems to pair well. For me I am happy the candy pink crb did not load so I can recover from my seawheeze purchases…culture clash and taryn collection. Just receiving the last pieces as I had trouble with sizing. Did you see the teal green swiftly ss on the US site? Omg GORGEOUS. It seems like LLL likes to put out a crazy number of similar blues, pinks, greys, maroons, etc, but a true green (or one close to it) is a color they don’t do often. I am praying this color comes to a crb as I rarely wear my swiftly ss. I’m also hoping the color I see on the screen is the same as the color in the store. They haven’t been great at that lately (faded zap and ice milk have both been misrepresented on the website in a few products). Yes! I had to return a bra in Ice Milk bc it was barely blue in person. I’ve returned three items because the color on the site was much nicer than what I received when I ordered. It was too expensive to justify keeping colors that were much duller in person than on the site. The photos used to do a better job representing the true color of the item, now the items look really saturated. Altering their new photos to make items look more appealing is somewhat misleading. If anyone was wondering if Pelt was similar to a previous color, I just received my Pelt Define today in the mail and it’s almost exactly the same as Black Cherry. Slightly more brown but they are so close it would not justify having them both. Yes, I would agree it is black cherry with a chocolate undertone. It comes and goes. It was gone for a while and then back until the past couple days. The new liner is blue, and the old one is black. This is perfect. I love having photos included in the comments. I couldn’t decide which festival bag I liked the most, decided to get them all and see when they come in. ?. I’m thinking the blue one will be going back for sure. I was tempted to do that too when I realized I have bags in everyone of those colors except blue! I’m considering the blue but thought I could wait on that color. I’m going to my LLL store tomorrow. Hopefully they will have it and I can see it in person. OT, but has anyone else noticed that shipping has slowed WAY down? I ordered a pair of pants on 8/7, they will not be delivered until tomorrow! I find this super frustrating.